Hindbærsnitter or 'raspberry bars' is a cake made of a shortcrust pastry, like the one you will use for a pie crust. Between the two layers of pastry there's a filling of a good raspberry jam. The cake is topped with an icing and colorful sprinkles. You'll find hindbærsnitter in almost every bakery shop in Denmark. The quality may varies greatly, mostly because the bakeries doesn't make hindbærsnitter daily. When you make these you'll find out that they won't keep, they will evaporate! Using a stand mixer with paddle attachment, mix together sugar, flour, butter, vanilla paste and baking powder. When the butter is mixed in well add the water, a little at a time, you might not need all of it. Be careful not to over mix the dough. Wrap the dough in plastic wrap and refrigerate dough for about 30 minutes. Rolling out the dough and when it's baked. Generously flour your counter, then place the chilled, unwrapped dough on the flour and flour the top of the dough. Roll you dough into a 8x12-inch (20x30 cm) rectangle. Re-flour your surface as needed, continually lifting and rotating your dough to make sure no parts are sticking. Lift the dough on to a parchment paper lined baking sheet. Cut the dough to a perfect rectangle and down the middle, so you get two 4x12-inch pieces. Bake them at 400°F (200°C) for 10-12 minutes. They should be very light browned and look a bit undercooked. Cool the cakes completely. My rectangles were a bit to brown, an cracked a bit when I sliced them. Spread an even layer of raspberry jam on one of the rectangles, put the other one on top to make a sandwich. Put the confectionary sugar in a pot over low heat. Slowly heat the sugar and add water until it becomes a thick paste. The icing should not be hot, just a bit warm, so it will dry quicker. 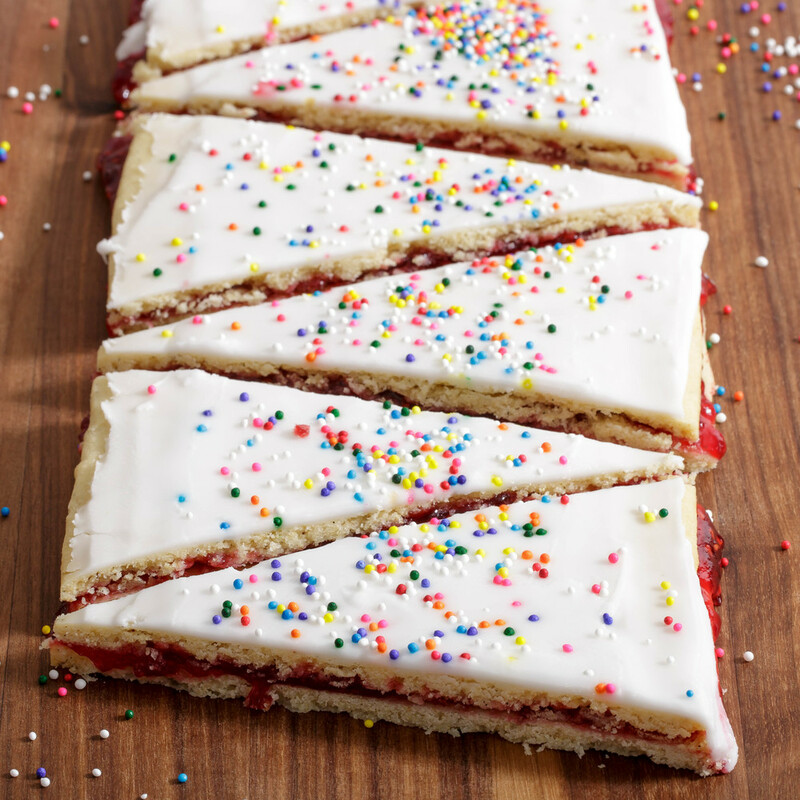 Spread a thin layer of the icing on the sandwiched cake, and put sprinkles on top. Slice the cake into the desired size with a sharp knife. The cake tends to break a bit in this process if the cake is baked too much. Serve the cake with a cup of the or coffee.